Gérard Cristian Alfaro Gonzales or Cristian Gonzales was born in Montevideo, Uruguay, August 30, 1976, the military forces of a father named Eduardo Alfaro and mother a nurse at the hospital named Meriam Gonzales Montevideo. The couple, especially the mother is a devout Catholic. Image of Our Lady always stuck in every corner of the room of the house and workplace. Even so fanatical, the image of Our Lady often carried everywhere by his mother. Obedience of the mother seems to affect the self-Gonzales, the third child of six brothers often went to church two or three times a week, so do not be surprised if Gonzales is known as the son of a devout in religion. His introduction to the world of football, started when Gonzales was 6 years old. Gonzales initially hoped to continue his father's footsteps into the military, but due to the insanity of the world of football, that hope was not fulfilled. The age to 18 years, a man who likes black met a Muslim woman from Indonesia, Eva Nurida Siregar in Chile, Latin America in 1994. At that Eva pursue Vinadelmar salsa school. Old acquaintance eventually liver Eva Gonzales store. And soon her love unrequited. For Catholics, this taciturn man known simply does not recognize Islam embraced her idol, so even with the mother. "Before I met my wife, I do not know Islam," said the man fans Rivaldo. So the role of Eva became severe, he repeatedly described Islam espoused. Enterprise woman was finally born in Pekanbaru. Eva Nurida Siregar Muslim and Christian Gerard Alfaro Gonzales Catholic married and living together in Uruguay in 1995. Career men who have height was 177 cm in soccer continues to grow, ranging from club Penarol Uruguay (1988-1991), South America (1994-1995), Huracan de Carientes Argentina (1997) and Deportivo Maldonado (2000-2002) dijajaikinya ever. Career development is actually not the role of Eva. Every time a football player who dijuluku elloco (the crazy man) is about to leave the match, the woman who used to be called Amor by Gonzales was always praying to Allah SWT. In praying sometimes deliberately Eva Gonzales raised his voice in hopes to hear. Habit is what makes Gonzalez became interested in the teachings of Islam. He himself will not move away before her lover had finished praying. Because of this prayer Gonzales found peace and tranquility that has not been obtained from previous religious affiliation. This prayer also makes him more excited and optimistic every time competed on the gridiron. Not only that, Eva Gonzales sometimes look for behaviors that always say bismilah when want to do something or say seek forgiveness when faced with conflict, as well as other words a Muslim prayer. In 2002 a man who likes the actor Tom Cruise has received an offer from an agent to play football in Indonesia. 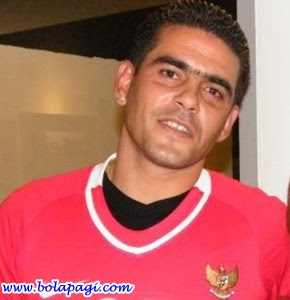 He was interested and eventually accepted the offer to play in Indonesia with PSM Makassar in 2003. Indonesia is predominantly Muslim, so far Gonzales Islam knows only through his wife, and was deemed not enough. Now players are fond of chicken soup can instantly find the adherents of Islam. "I never forced Gonzales to Islam". Eva said "Sometimes when I read a book about the teachings of Islam, I keep the book on the table and read it secretly Christian, he then knows how attitudes towards her husband in Islam and how the wife against her husband" continued recalled the first time living in Indonesia with Gonzales. Then right on 9th October 2003 Christian Gonzales decided to convert to Islam on the basis of their own accord in the presence of the Great Mosque cleric Mustafa al Akbar Surabaya. Christian Gerard Alfaro Gonzales later named Mustafa Habibi. Mustafa name taken from his spiritual teacher, while the cleric Mustafa Habibi (my love) was taken because of his immense love of his wife to Christian Gonzales. Islam has the impression for Gonzales "Since in Islam every prayer as something no greeting when coming home assalamualaikum say, when you like doing something beginning with basmalah, and every step in Islam always wrote was reading. And this became my heart feel calm "Reveal Eva Gonzales quoted. Islamic man Manchester United fans were then legalized in Kediri, converts to the Charter of the local religious affairs as well legalize marriage between Christian Gonzalez by Eva Siregar. The mother, Meriam Gonzales reportedly Islam as his son, accept willingly chosen religion beloved child, she just wished her success in the future. However, to establish family relationships, Eva Gonzales and do not miss the daily contact her, just say the news from faraway countries. As if finding water in the Sahara desert, so the condition of the player who scored 33 goals for PSM Makassar time. With the guidance of Ustadz Mustafa, Gonzales got to know Islam more deeply. Fatimah Hj In addition, the famous scholars Kirkcaldy and Hj. Nurhasanah Gonzales contributed to the spiritual guru. Even Majlis Ulama Gresik itself to appoint Gonzales and his family as their adopted child. Hj. Nurhasanah used to be called the Mother, always encouraged Gonzales to the advice to always pray. "You have to be strong-strong prayer" recalls Eva Hj imitate speech. Nurhasanah. So even Hj Fatimah, cleric building the mosque with the name of this Gonzali either via telephone or face to face is always encouraged Gonzales to prayer, crying. While in Kediri, a father of four children play Persik Kediri defend and stay in housing Persada Park. This house became the beginning of a new life for Mustafa Habibi. Islam has been a lot of change themselves. Every midnight he woke his wife used to pray tahajud or just pray. Every time the game will be held the next day, his wife Eva always hold lectures attended by mothers around the house and ended with the reading of prayers. While the study took place, Gonzales always pay attention to lectures and sat beside Eva or sometimes he sits behind the study mothers. So do not be surprised if Eva forgot to prepare the recitation of the first people to call it was her own husband. But Gonzales is not a perfect man, just like any other player in the game of football, sometimes conflict is inevitable. Recorded in 2004, Gonzales never had an issue with Abu Salih Bantam Discussion Board Pengda PSM Makassar as host Persikota Tangerang. In 2006, Gonzales troubled by Emanuel de Porras striker PSIS. A year later, Gonzales dealing with the referee Rahmat Hidayat against Pelita Jaya jawabarat and in 2008, Gonzales dealing with Erwinsyah Hasibuan defender of PSMs. Of course, this led to sanctions permaslahan issued PSSI disciplinary teams, ranging from fines to the ban. Sanctions for Gonzales is a tough test, and at the same time spiritual teachers always membingbing Gonzales and Gonzales encouraged to keep up and be patient received a trial. Evidently, this advice successfully brought Gonzales continued to get up and fight back to score a goal on the gridiron. Popularity and abundant wealth does not really affect Gonzales, he is not the type of person who likes to burst spending money. In fact he would be very angry if someone took him to clubs or nightclubs and Gonzales will not hesitate to break with that person. Treasure which he achieved from his fight in football he prefers to give to the orphans, the poor and women recitals as Zakat and Sadaqah. This is done because Gonzales knows obligation of zakat which he read Islamic books belonging to his wife. Had Gonzales and his wife wants to go for Hajj in 2008, but God wills others in getting money from the intermediate top score as many as 50 million was used to fund operations to give birth to her fourth child, Vanesa Siregar Gonzales. Regarding the habit in a soccer game, a player who diligently clean the house each time leaving play always carried rosary in her purse and some prayer books as supplies. Furthermore unlike other Muslim players who prostration of gratitude when creating goals for Gonzales form of gratitude when a goal is scored by lifting a finger to his mouth as he looked up at the sky, it was a gesture of gratitude to God Almighty. Even when the defending team Arsenal London, he Berkalung verse uses the number back seat 99. This number was chosen not without reason, 99 is a sign of God's known asthma Asmaul Husna. Expectations relating to the future, are concerned with the Gonzales family "I hope the children become pious and healthy children wal afiyat, may God protect, so that when problems come up so quickly lost" the desire Gonzales. Cristian is one of the most lethal striker in the history of Indonesian football competition. His ability to kick, scored, positioning, vision of the game, and the header is the flagship. Besides his ability, he is also known for having excellent physical. On 21 November 2010 Cristian Gonzales debuted as a member of the football team against Timor Leste and Indonesia immediately scored two goals on his debut. Subsequently, he entered as a core member of the national team of Indonesia in the AFF Suzuki Cup 2010.